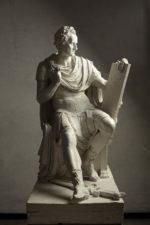 The Frick Collection is dedicating an exhibition to Antonio Canova’s 1821 statue of George Washington in Roman garb (23 May-23 September). Commissioned for the State House in Raleigh, North Carolina, the statue was destroyed in a fire in the 1830s. Until now the full-sized preparatory plaster model had never left Italy. “Washington was shown as a modern Cincinnatus, so the overarching concept of the commission was the important idea of the peaceful surrender of power from one elected president to another,” explains the show’s curator Xavier Salomon.